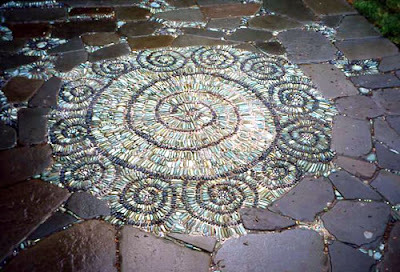 Stone Art Blog: Jeffrey Bale's Mosaic Pilgrimage, a labour of love, a labour of pebbles! Many of you may already be familiar with the work of Jeffery Bale, but for those of you who aren’t, I feel the need to share his work with you. 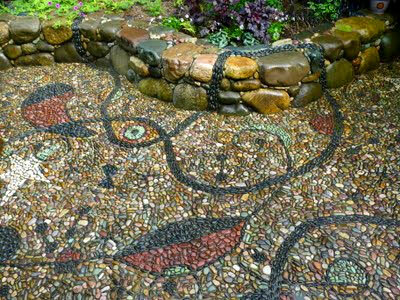 I am a big fan of mosaics. One of my favourite city to visit is Barcelona, mainly because of all the wonderful mosaics of Gaudi that decorate much of the city. I have even ventured to make a few mosaics myself upon occasion (see my blog post on making mosaics) but nothing as large, detailed or impressive as the mosaics of Jeffery. 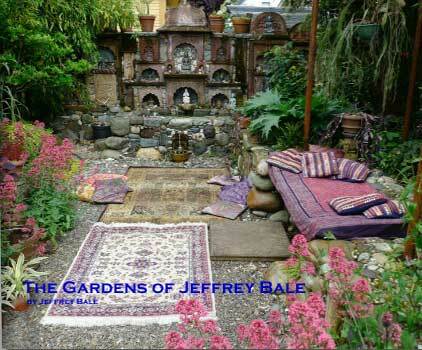 For Jeffery Bale, gardens and stones are not just his passion and his livelihood, they are instilled in his blood, passed on through a family history of gardeners and geologists. Quite possibly on some kind of subconscious level, these family genetics helped pave the way for his future carer. Jeffery likes to think so anyway. It would also explain why he developed a passion for these traits at a very young age. 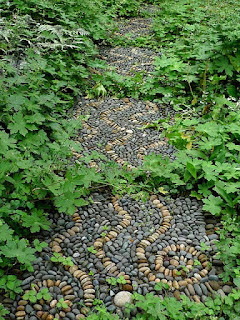 Following his passion for gardening, Jeffery graduated with a degree in Landscape Architecture from the University of Oregon in 1981, but after a short stint working a desk job designing for a landscaping firm, Jeffery felt the need to get his hands dirty. He spent the next few years experimenting in friends gardens and gaining onsite experience, before in 1987 deciding to set out on a sort of mosaic pilgrimage, to go and see the gardens of the Alhambra in Granada and ParqueGuell in Barcelona as the images of these places had mesmerized him back in college, and stayed with him long after. Jeffery began his ‘mosaic pilgrimage’ travelling to Madrid in Spain and then on to Lisbon, Portugal, and like any good pilgrimage, it didn’t take him long to have an epiphany. Here, standing in a city encrusted in mosaics made from small hand split blocks of white limestone and black basalt, every plaza and sidewalk had a different design, everywhere he went he was looking at marvellous decorative pavements, something he had never seen back home. So this was it. 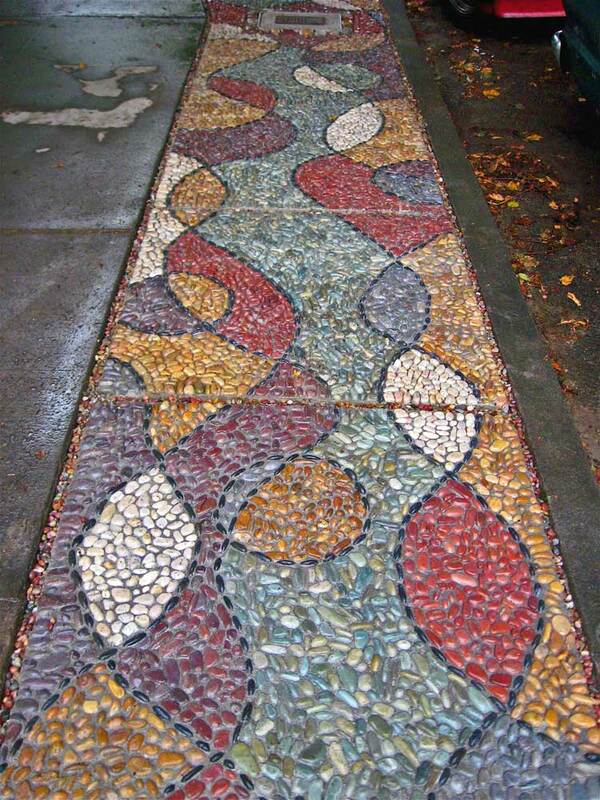 Jeffery Bale from of Eugene, Oregon, USA felt destined to return home to America to replace its concrete pavements with stones and jewels. So when he returned home he set to work on a patio for his newly purchased home in N.E. Portland. His design was inspired after reading the ‘Tao of Physics’ by Fritjof Capra. Not really knowing the methods of construction in Spain, he developed his own technique, setting the pebbles in a bed of wet mortar. 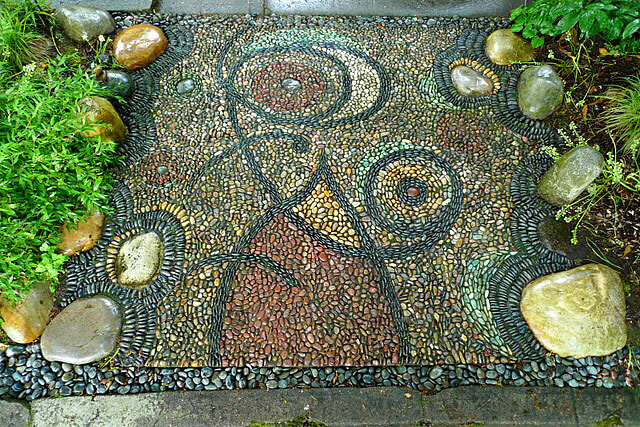 From here Jeffery honed his mosaicing skills by creating mosaics whenever the opportunity arose, mainly making mosaics for friends and family. 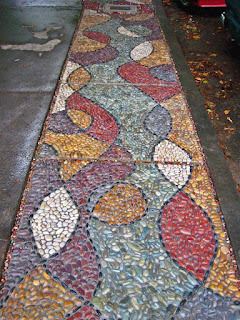 It wasn’t until a few years later that he convinced a client in Northwest Portland to let him build a pebble mosaic patio for him, along with a mosaic path and parking strip pavements. 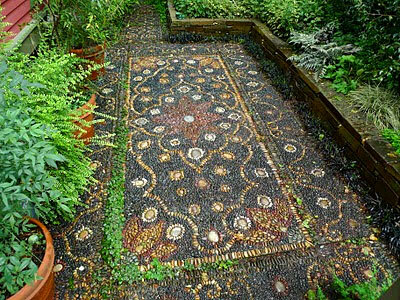 The patio is a 12 by 18 foot Persian Carpet. 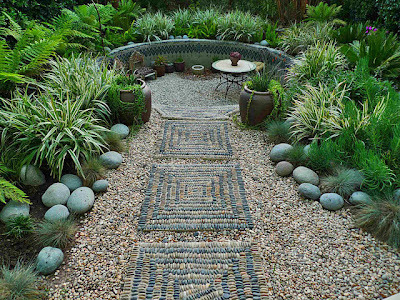 This patio would later be photographed by Alan Mandell and Jerry Harpur of England, being published several times, and even making the cover of Landscape Architecture Magazine in August of 2005. 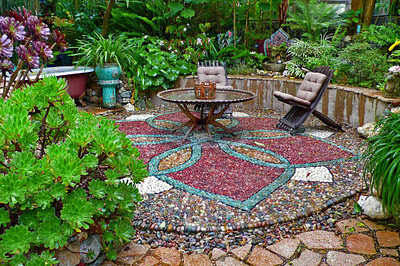 Suddenly Jeffery was not just a garden designer anymore, he was bonafide pebble mosaic artist as well, meaning that he could frequently incorporate these lovely mosaics into many of his projects. Looking at one of Jeffery’s mosaic creation, one can begin to appreciate the time and effort that must have been put in to create it. 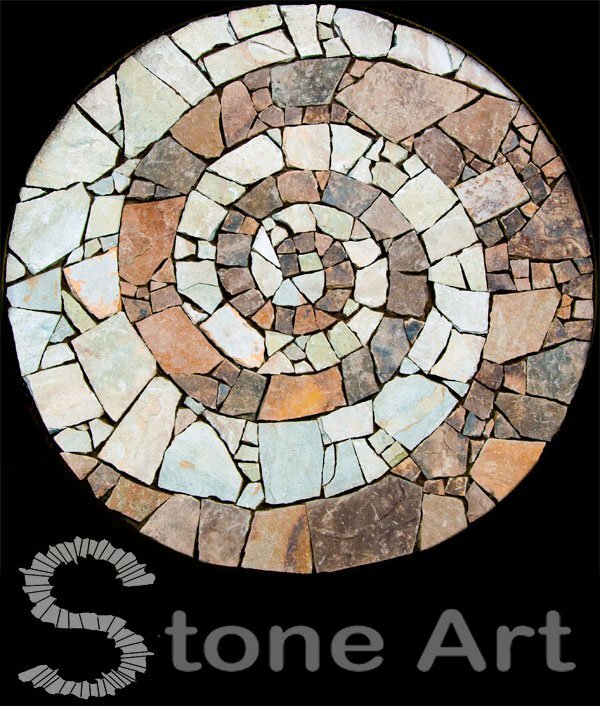 Each stone has been carefully placed by colour, shape and size to fit into these wonderful shapes and patterns. 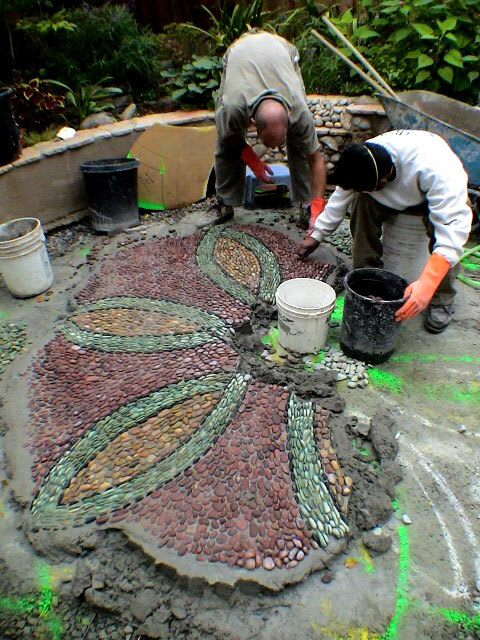 But what one might easily overlook is that every single stone in each mosaic has not only been laid by Jeffery, they have also been painstakingly picked by him. 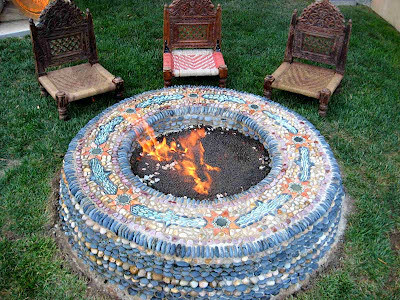 'Council Ring’ fire pit. 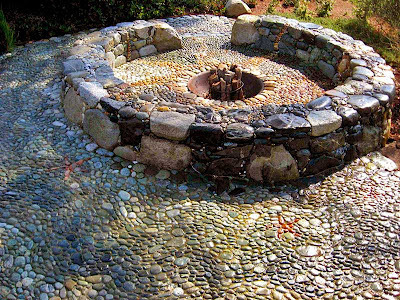 Most of the stone for this project was gathered from the beach below the property, giving it a strong connection to it’s setting. 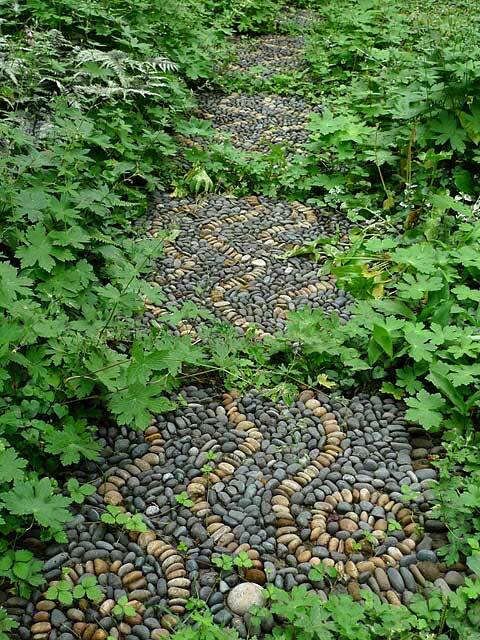 I love the simplicity of the footpath. The skilfully arranged Molalla flagstones are cut and tightly fitted together, with the gaps filled with pebble mosaic which connects to the other Miro inspired mosaics in the garden. 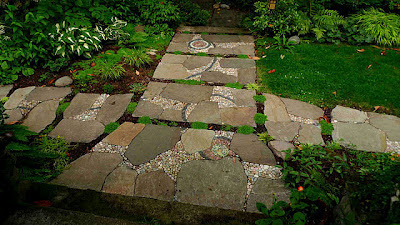 Jeff also cleverly incorporated gaps between the rectangle pads to allow for permeability in the pavement, and for the garden to flow through the work in planted lines. The ‘mosaic pilgrimage’ that Jeffery set out on back in 1987, is in fact one that he continues throughout his career. When ever the opportunity arises Jeffery sets off to get inspired by the different cultures and mosaics from around the world. Looking through his portfolio of work you can see much of what he has taken back home with him from socking in these different cultures. Moroccan inspired fire pit. The pit is built up of bands of pebble mosaic using black and gold Mexican beach pebbles, which are then capped with a band of eight pointed stars matching the other mosaics in the garden. 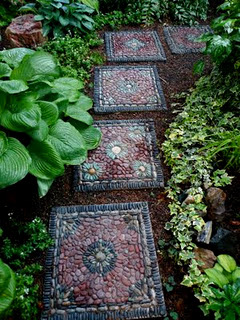 Lotus Step Stone Path.The lotus blossoms, alluding to a Buddhist Jataka Tale about Sidhartha Gautama being born, and having lotus blossoms spring from his footprints. There is much more amazing work by Jeffery that I was hoping to share with you, but as this post is starting to get quite long I will leave it at that. To see more information about Jeffery and more photos of his work check out his website http://www.jeffreygardens.com. 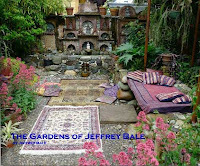 And don't forget to check out his wonderful blog http://jeffreygardens.blogspot.com. Thanks to Jeffery Bale for his kind permission for the use of the photos and writings from his website and blog for this post. It's been lovely to see your work - isn't the Internet amazing! I am inspired by your passion to do your own thing and all that that involves. Sometimes I do wonder what I am doing snipping away in my studio - loving what I do and wondering if any one else will. But you just have to believe in yourself and keep working! 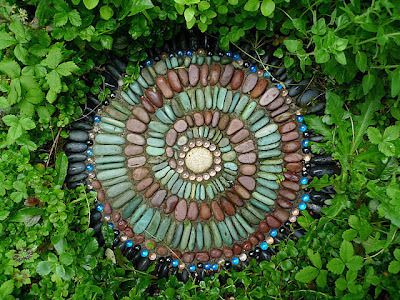 I love the subtle colours in your work, the patterns and the way they work with their surroundings. Thanks for your post on Jeffrey, he certainly deserves the recognition. 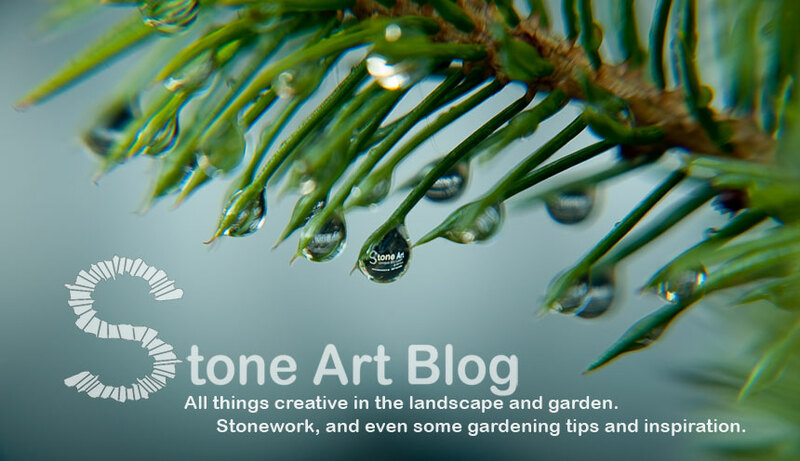 I follow his blog and have even linked to it on my Blogs I Follow section on my blog site. I think he has one of the best blogs on the subject. His content is exceptional, in depth and informative. One of the best parts is his willingness to share his technique and not try to make it mysterious as if he is guarding secrets. He is truly a master. 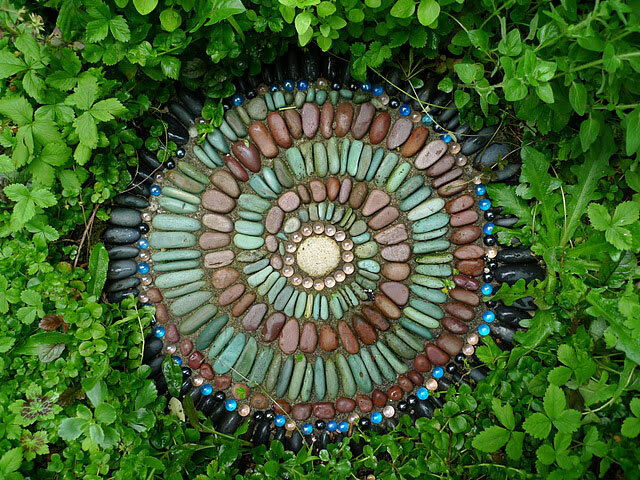 Wow, these mosaics are amazing and truly the work of a gifted artist. 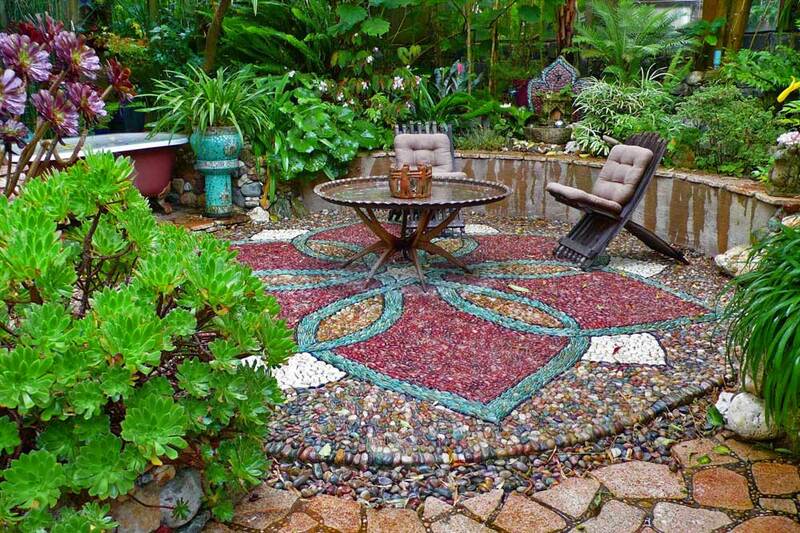 I have long wanted some mosaic work in my own garden. Your post is full of inspiration! 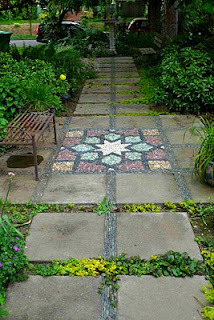 Wonderful Islamic Arts catch the attention of some high-end want to award our lives which is so contemporary in nature. Historic sign in arts has cemented the way to swallow Islamic arts and crafts which are extreme investment in lieu of the years to be as long as. Our natural attachment with our homes need the luxury issue & these wonderful unique designs of Islamic arts in Dubai are twisted by supply and excessive genre paints. This is something bake them a genre apart. I love your art collection. Wonderful! Fantastic, its really painstaking to finish these design, but persistence paid well, afterwards, It's comparable to tiling. Really fascinate me,I love art and this one surely is a great example of work of art,Thanks for sharing this one. just wonderful.Thanks for the share. Great stuff, just nice! Wow!! Its unbelievable beautiful work of mosaic products. I love the details on your ideas of doing something right from beginning.Keep sharing such amazing thoughts..